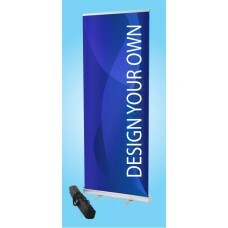 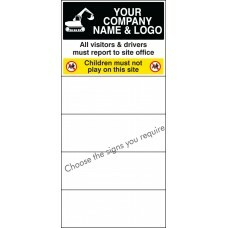 This PVC banner comes complete with fabric loops allowing insert of a scaffold tube for fixing and can include any wording, design, graphics or photography you wish Printed PVC banners offer a quick a.. 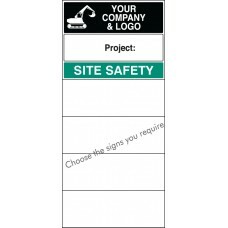 This PVC banner comes complete with fabric loops allowing insert of a scaffold tube for fixing and includes a weather resistant wallet which enables you to insert your companies license number. 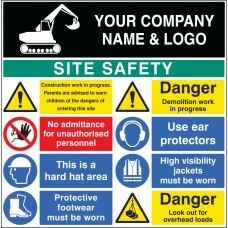 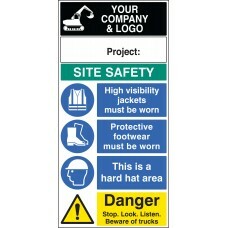 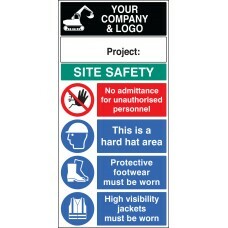 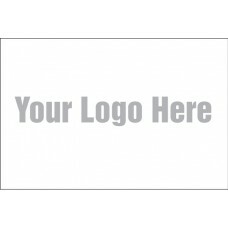 All ot..
Multi-message signs provide multiple safety messages on one sign.To add your company name, logo or project details please supply in high resolution format when ordering Miscellaneous Products / Mater..
Site safety sign runs through a set of key safety questions to ask before going onto site. 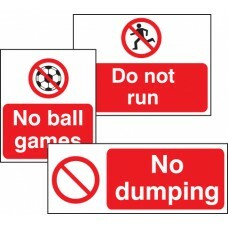 Miscellaneous Products / MaterialsAny product outside of our standard choice of material/size range starts w..
4mm Fluted twin wall polypropylene - fully recyclableFoldable for easy storage; Double-sided; Self-standing; Lightweight, durable and waterproof; Please specify your required message (up to 1words..
4mm Fluted twin wall polypropylene - fully recyclableFoldable for easy storage; Double-sided; Self-standing; Lightweight, durable and waterproof; Specify your required message when ordering - up t..
You can create your own aluminium mandatory sign with any text / symbol you wish. 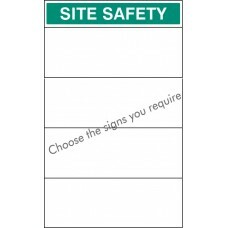 If you're unsure of the symbol don't worry we'll help.Now that you've selected aluminium, all that's left to do is to ..
You can create your own aluminium composite mandatory sign with any text / symbol you wish. 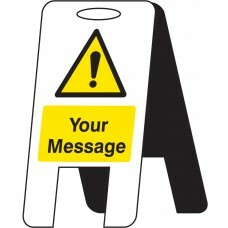 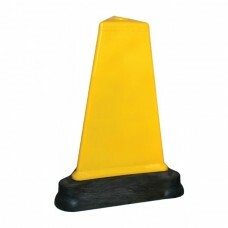 If you're unsure of the symbol don't worry we'll help.Now that you've selected aluminium composite, all that..
You can create your own rigid plastic warning sign with any text / symbol you wish. 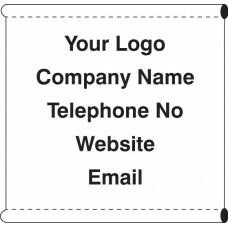 If you're unsure of the symbol don't worry we'll help.Now that you've selected the material you wish to use, all tha..
You can create your own self adhesive vinyl mandatory sticker with any text / symbol you wish. 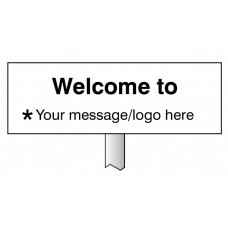 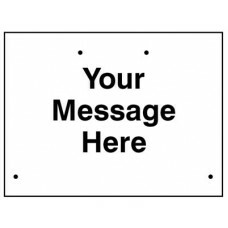 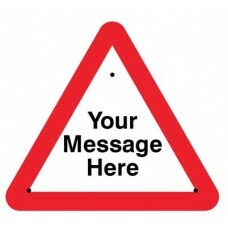 If you're unsure of the symbol don't worry we'll help.Now that you've selected self adhesive vinyl, all t..
You can create your own 5mm Foam PVC mandatory sign with any text / symbol you wish. 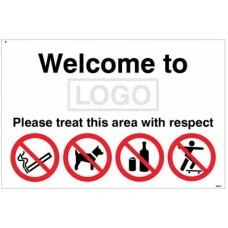 If you're unsure of the symbol don't worry we'll help.Now that you've selected the material you wish to use, all th..
You can create your own aluminium prohibition sign with any text / symbol you wish. 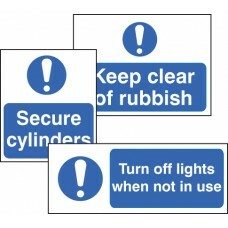 If you're unsure of the symbol don't worry we'll help.Now that you've selected aluminium, all that's left to do is t..
You can create your own aluminium composite prohibition sign with any text / symbol you wish. 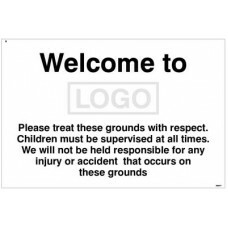 If you're unsure of the symbol don't worry we'll help.Now that you've selected aluminium composite, all th..
You can create your own rigid plastic mandatory sign with any text / symbol you wish. 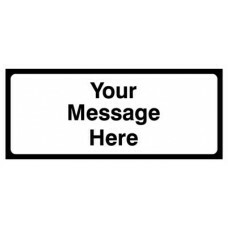 If you're unsure of the symbol don't worry we'll help.Now that you've selected the material you wish to use, all t..
You can create your own self adhesive vinyl prohibition sticker with any text / symbol you wish. 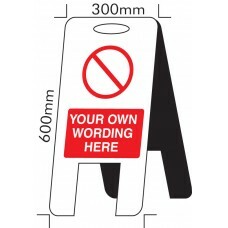 If you're unsure of the symbol don't worry we'll help.Now that you've selected self adhesive vinyl, all..
You can create your own 5mm Foam PVC prohibition sign with any text / symbol you wish. 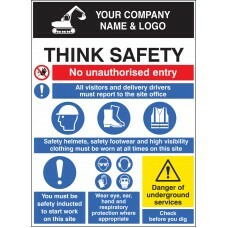 If you're unsure of the symbol don't worry we'll help.Now that you've selected the material you wish to use, all ..
You can create your own aluminium composite warning sign with any text / symbol you wish. 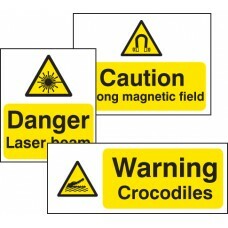 If you're unsure of the symbol don't worry we'll help.Now that you've selected aluminium composite, all that's..
You can create your own 5mm Foam PVC warning sign with any text / symbol you wish. 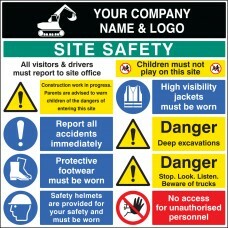 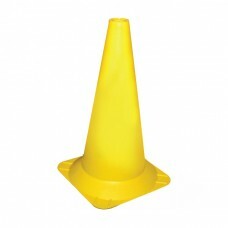 If you're unsure of the symbol don't worry we'll help.Now that you've selected the material you wish to use, all tha..